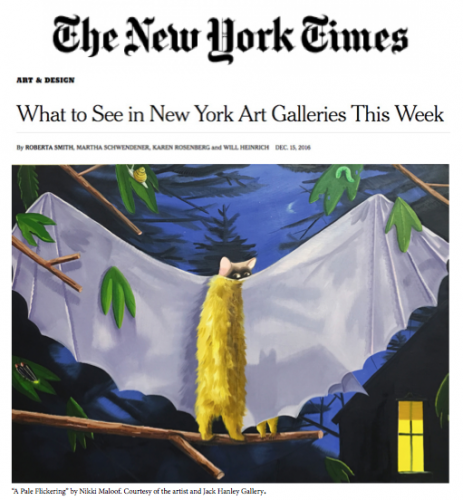 After a global wave of figurative painting that poked, prodded and examined the human body from every perspective, the art world is now overrun with critters. 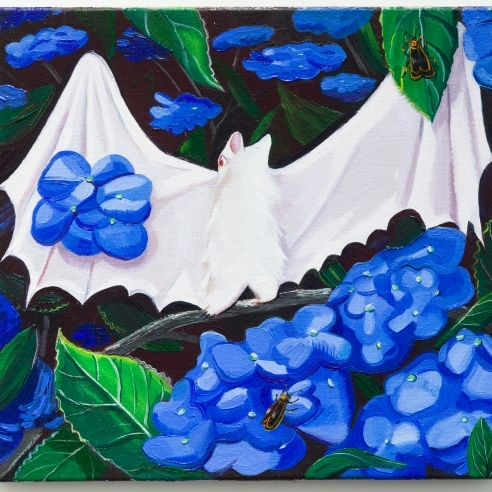 Marian Goodman’s London gallery has a group show called “Animality,” while in New York flora and fauna are flourishing in Nikki Maloof’s debut solo show, “After Midnight,” at Jack Hanley. 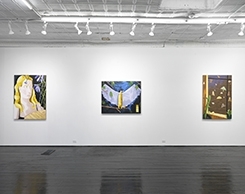 Ms. Maloof takes a nocturnal view of the animal world, as the show’s title suggests, but it is also culled from comics and animation. Her anthropomorphic menagerie includes tigers, dogs, cats, monkeys, bats and insects (or apparent versions of these), painted in acid yellows and greens, and the orange and purple of an illuminated night. (Her “Starry Night” nods to van Gogh, but it is a window screen fixed with bugs rather than a celestial display.) Expressive and thoughtful, the animals in Ms. Maloof’s paintings clearly conjure humans, just as two canvases featuring a blank-eyed blond woman suggest a slinking, silent animal. In past centuries, animals in art represented many things, from religious faith to political affiliations. Ms. Maloof’s mirror the popularity of animals on social media, where, despite disagreements on virtually every other topic, we can usually reach consensus on cute animal antics or admire cross-species friendships. These serve as utopian models for humans, of course. And while Ms. Maloof doesn’t make any grand claims in her paintings, her subjects’ goofy, uncanny expressions and psychological states suggest a post-human (and postelection) art world in which animals seem purer, more attractive and sympathetic than we do.